Who knows if the market will go up or down? How much will it move? And for how long a trend will continue? In reality, risk management is the only thing you really have control over. That?s why it?s so vitally important to your trading money management strategy. Sadly there are no entry criteria that will pick winning trades 100% of the time.As you?re about to find out, it takes more than a good entry to make money in the market. Nevertheless, most novice traders undertake a determined search to find the perfect indicator(s) that will lead them to trading success. Even though the idea of this ?holy grail? is obviously far fetched, I too have searched for it. So why do almost all market traders search for the perfect entry? I believe the reason is a subconscious one. Focusing on an entry point gives traders a false sense of control. The point at which you have chosen to enter the market is the point at which the market is doing exactly what you want it to do. This can create a sense that you are not only controlling the entry, but the trade itself. Unfortunately, this couldn?t be further from the truth. The market is going to do what it?s going to do ? it doesn?t care for your well-thought-out entry criteria. Repeating what I said just a moment ago, in trading money management risk management really is the only thing you have control over. Despite the importance of risk management, I believe traders still under appreciate it. You see most people look at trading as a game of odds. You may be guilty of this too. True, it does involve odds, but odds alone do not tell the whole story. When you look at trading systems, are you someone who only looks at the ratio of wins to losses? After all, it seems logical that a system that generates eight winning trades out of ten is better than one that only has four out of ten? right? Not always. Let?s take Richard Dennis? Turtle trading system as an example. As I mentioned in chapter 4, this system won 40% of the time and lost 60% ? but it was still hugely successful. You see, it?s not about how often you win, but also about how much you win. Winning and profiting can be two completely different things. Here?s what I mean: if your system had an 80% chance of winning $100 and a 20% chance of losing $1,000, in the end you are bound to lose everything, despite the fact that you may experience many winning trades. Stringing together eight winning trades, valued at $100 each, followed by a couple of $1,000 losses will guarantee a trip to the poor house. On the flip side, a couple of $1,000 wins is far better for your wallet than eight $100 looses, as demonstrated in the following scenario about system biases, commonly referred to as expectancy. Expectancy is just a fancy name for what I have just described. A trading system with these metrics has what is known as a negative expectancy. Compare that with our second example where the system has a positive expectancy and you could lose 80% of the time, yet still be profitable. This loses 80% of the time yet shows a profit of $120 per trade. Which situation would you rather find yourself in? This is just one example, but learning to roll with the small losses as part of an overall strategy is something that would-be traders find difficult.And it?s one reason why they are never truly successful.As mentioned previously, humans will instinctively take profits the moment they appear and ride losses until they are unbearable. Unfortunately, this is exactly what an 80:20 negative expectancy system looks like: taking lots of small wins, and losing all those profits ? and more ? to a few very large losses. Without clearly defined risk management rules, you too will fall into this very large trap of trading. And it?s not only traders who apply these rules to their work ? all the best professional poker players apply risk management rules to the way they play. I was once speaking to a player who told me that one of the risk management rules he applies is to never risk more than 2% of his entire gambling float in a single hand. In this way, he knows it is okay to lose a game here or there because it?s only a small part of his overall purse. At the time I thought, ?Isn?t that interesting? That?s one of the rules I follow when trading?. Of course, there?s more to it than that. What is trading risk management? Let?s look at each of them in turn. Determine how much money you set aside for trading. Remember, the more you trade with, the more you stand to win or lose. This decision needs to be based on your overall trading goals, while recognising your other financial commitments outside of trading. This was discussed in chapter 3. Determine the maximum amount of capital you are prepared to lose in one trade. Like the professional poker player I met, you might set your limit at 2%. In Market Wizard Larry Hite recommends not going beyond 1%. Other professional traders say 0.25%.? You need to find the sweet spot to match your trading float. Set a predefined point at which you admit defeat and exit the trade.When you enter a position, you never know where you are in the trend. The trend might be in the middle of its run or at its end. That?s why you must set your initial stop. It?s like saying, ?If a particular trade doesn?t do what I thought it would, I?m going to get out. ?Generally, short-term traders will set their stops closer to the price, while longer term traders tend to give their trades a little more room to move. Note: by setting your stop losses too tight, you?ll decrease the reliability of your system because you?ll get stopped out more often. Plus, the more you?re in and out of trades, the higher your transaction costs. There are many ways to set initial stops, such as technicals, indicators, percentages and more.Whatever you choose, the important thing is to just have something in place. Sure, you can always drive through that red light, but you risk getting wiped out by a semi-trailer! After setting your initial stop, you need a method for calculating your position size so you never risk more than your predefined maximum loss. maximum loss / initial stop size? = number of units to purchase. A basic but very powerful equation! These four areas are the foundation of any excellent trading money management strategy. I learnt much of my trading money management and risk management through reading Van Tharp?s work. As you can see in the excerpt in chapter 5, Tharp can, at times, be somewhat over-complicated in his language, making it hard to master his strategies. Part of my process for fully understanding Tharp?s theories was to write them down in my own words. I believe Einstein had it right when he said, ?Make everything as simple as possible, but not simpler?. I later published these articles for my private Xero Melbourne clients in a course called Trading Secrets Revealed. You might find it helpful for deciphering what seem like complex and sophisticated concepts. Remember, money management really is the most important aspect of any trading system. By documenting this step, you have put yourself among the top 5% of traders. 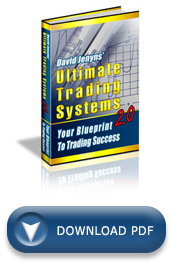 Purchase Trading Secrets Revealed and document your risk management rules – www.ultimate-trading-systems.com/tsr. re trade size……i am not clear ….wouldn\’t max loss/initial stop size always equal 1…..unless stop is moved?? The maximum loss is the total amount you’re willing to lose on any trade (typically a percentage of your trading float). The initial stop size is the difference between your entry price and your stop price (on a per unit basis). The stop size is always much smaller than the maximum loss and therefore won’t ever equal 1. If you need some more help on the topic check out my course here: http://www.ultimate-trading-systems.com/tsr. Yours are the best videos I have seen, but here is a hands on problem; I am stuck in a CNLG trade, missed the inital spike but decided to gamle on a follow up and of course not following my plan ! But I get drawn to the message boards and start to “hope”…So now I am hoping that this is the bottom and we couls spike from here but still doubting it from chart history. When and if you reply to this I will probably be out of this trade but your imput would be interesting as a matter of strategy. Thanks for your comments… that said, not too sure what advice I can offer here other than you need to be following a system. If I were in your position, and I didn’t have a system, I personally wouldn’t be trading. Unless I missed something I use Maximum Loss/(Fill Price-Initial Stop) to determine position size. However, fill price is not determined untill the order is actually filled. Please let me know if you’re a http://www.trading-secrets-revealed.com owner. I only ask so that I can point you to the correct section to help answer your question. On the balance, which of the following two categories of systems have you found the most consistently profitable and useable? Those that lose much more often than they lose, or those than win much more often than they lose? I have found that no matter what I do, I keep coming back to 0. Meaning that, in the long run, I end up losing whatever money I make, or I end up making back whatever money I lose. This is in backtesting. I can’t find a system that generates an uptrending equity curve, unless I use a form of negative progressive money management system. I understand the equations “(80% x $100) ? (20% x $1000) or $80 ? $200 = ?$120” and “(20% x $1000) ? (80% x $100) or $200 ? $80 = +$120”, but usually, all I’ve ever seen is “”(80% x $250) ? (20% x $1000) or $200 ? $200 = $0” and “”(20% x $1000) ? (80% x $250) or $200 ? $200 = $0”.